Recently I found my grandmother's recipe box, and I'm slowly working through scanning the recipes and transcribing them for my kids. I posted her cranberry bread recipe. 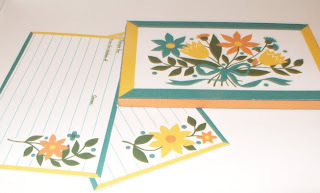 The art on her 40 year old recipe box is a pretty Pennsylvania Dutch design that I decided I wanted to put on a recipe card set for everyone. The company that made it is Syndicate Mfg. Co in Pennsylvania. Her recipe box saw a lot of active use in her kitchen for many years, it's rusted, beat up, and yellowed. Reduce your waste with these fantastic upclycing ideas. Wow, I love these! That box is such a treasure. You're so generous to create these and share! I'll be linking. I have this recipe box!! When I was in second grade my mother bought it for me. There were recipe cards that had my name printed on them but they didn't match the box. Thank you for scaning in some blank recipe cards now I have some that match! Treasure your grandmothers recipes. I don't have any recipes from my grandmothers. 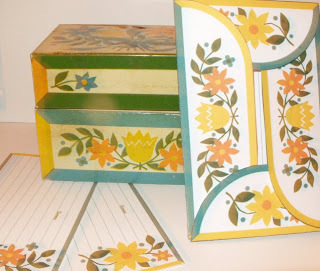 I have the EXACT same recipe card box from my grandmother! Thank you for making the printable. Wanted you to know I posted a link to these printables today on my blog, PaperFriendly.